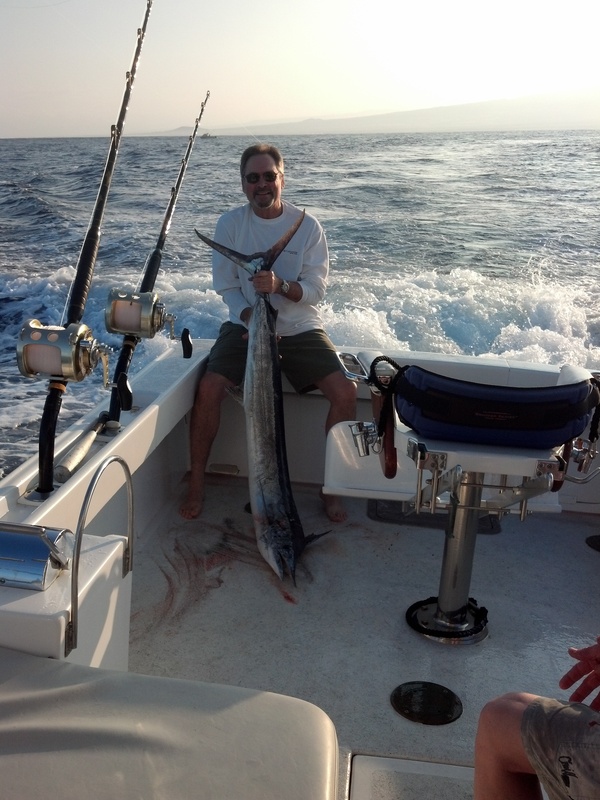 ← February 2, 2013 Mike Day 2 & 3 – More Stripeys, Spearfish and Mahimahi! February 6, 2013 Jeff Returns For More Lepika Action! Jeff fished with me last year and we did really good that day. We caught two really nice ahis, a spearfish and a blue marlin. On this trip to Kona Jeff booked two full days. Today, he brought along his friends Mike and Jim. The bite on the Grounds has been pretty good and the current was right for a good bite up there. We trolled our way north and as we passed the airport the long rigger took a solid bite. Jim was first up and fought his first ever short nose spearfish tot he boat. Since they wanted some fish to take home we decided to take it for the grill! Jim’s spearfish weighed about 30lbs! We continued on and saw good signs of bait on the ledge. We caught a few live baits and walked them up the ledge. It didn’t take long when a big blue came in and ate the long bait. We fed the blue and then set the hooks! The fish came up briefly and shook it’s head on the surface. It looked to be about 300lbs but unfortunately it came off. We would miss another short nose spearfish today and watched as a 200lb blue marlin swam down the side of the boat and ignored our lures! UGH…Good news is the blue marlin have arrived!